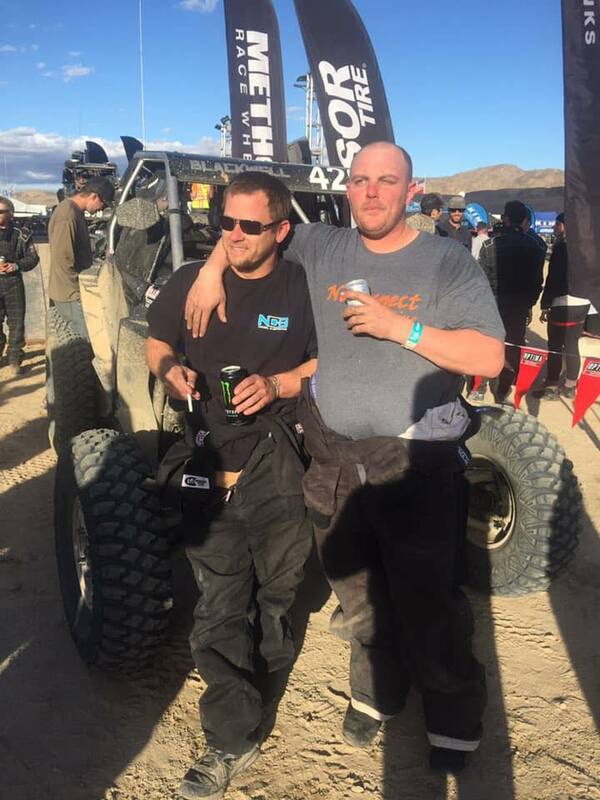 The journey began back in May of 2018 when Nate over at NCB diesel gave me a call asking to build them a SxS to run King of the Hammers in. We talked about many different options and which platform to start with. 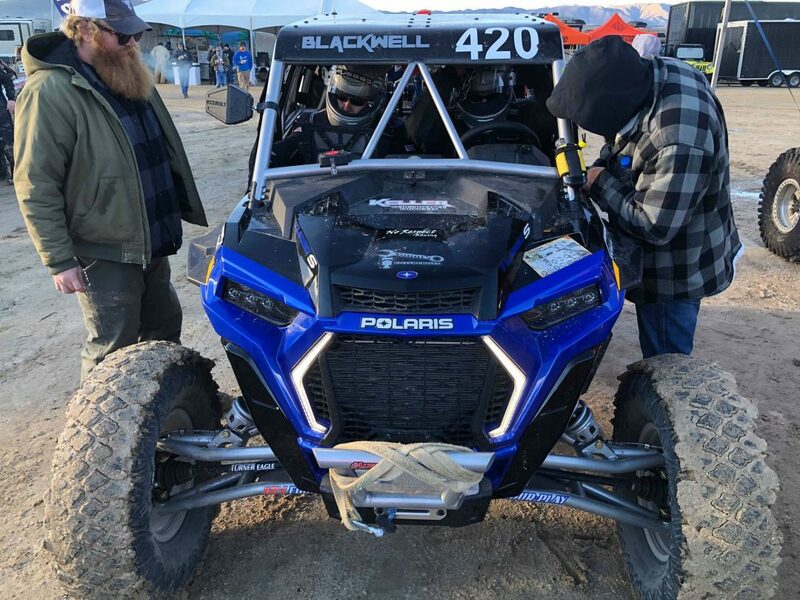 There was rumors of a new car being released from Polaris so we opted to wait and when the RZR XP Turbo S was released we knew that was the SxS of choice. It was a new platform and many parts were not available for it at that time. Our first plan was to make a custom set of suspension for it to bring it back to regular width but, after a short test drive that idea was squashed!! The new Turbo S was so much more stable and handled amazingly well. So with our car picked out we then called around to some of the best companies to source some parts for the s. With a build direction and plan it was time to wait for the parts to be manufactured. Getting closer to koh our testing wasn’t able to happen due to snowfall on the ground for over a month back in Missouri. Finally the day before the Rzr got loaded into the trailer to make its way out west. I couldn’t take it anymore and made some snow whoops with the tractor in sub freezing temps we got our first shock testing done. Had a driveline failure and no spare parts for it. First up belt temps we went to Armada and they helped make a ram air for the belt box. We also sourced a fan from desercraft and went back to stock clutches this seemed to cure our issues. We made some crossover and preload adjustments that made night and day difference how the car acted at speed . Had 2 driveshafts overnighted to fix the driveline issue this cost us a full day of pre running and. We never got a chance to set foot on lap 2 of the course! For qualifying we decided to run a set of 30 in tires as we only had 6 33 race tires and didn’t want to risk ruining one of them in qualifying. 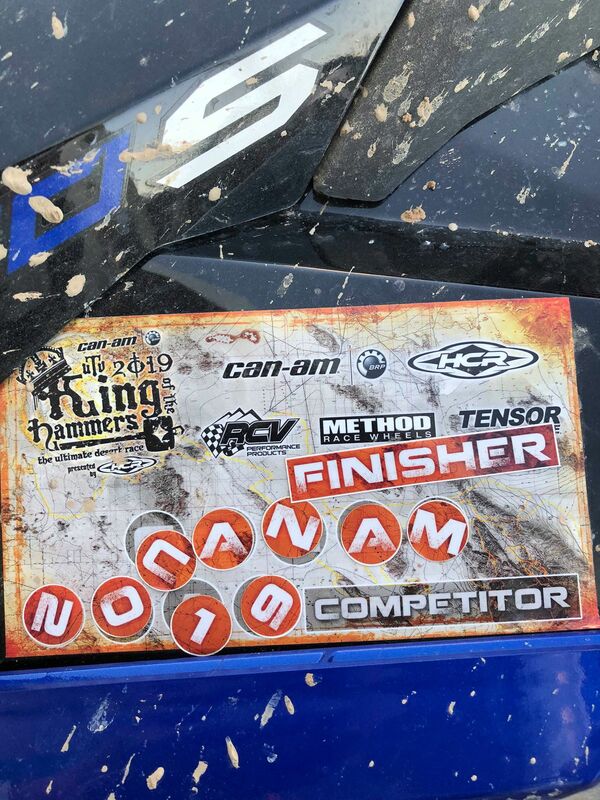 I was going to give it all the car could do well I broke 2 wheels halfway through qualifying and didn’t get a fast time put us a 57 starting position. Race day is upon us and knowing we had to put in a fast first lap to get around some of the slower rock racers or we would be in traffic jams all afternoon. Take off the line on kill mode passed over 10 cars by mile marker 14 where our first issue bit us running 80 mph belt blows. Out the car we go and Nate learned a few new cuss words at this point. Fixed and running again we stop at pit 1a Mile 17 for fuel top off and throw a extra belt on the cage. Now time to hit the marine base and it was littered with broken down cars and a lot of slower traffic just trying to get a finish. Pretty sure this is where Nate started praying we had a smoking clean run through Cougar Buttes passing many cars on the base. 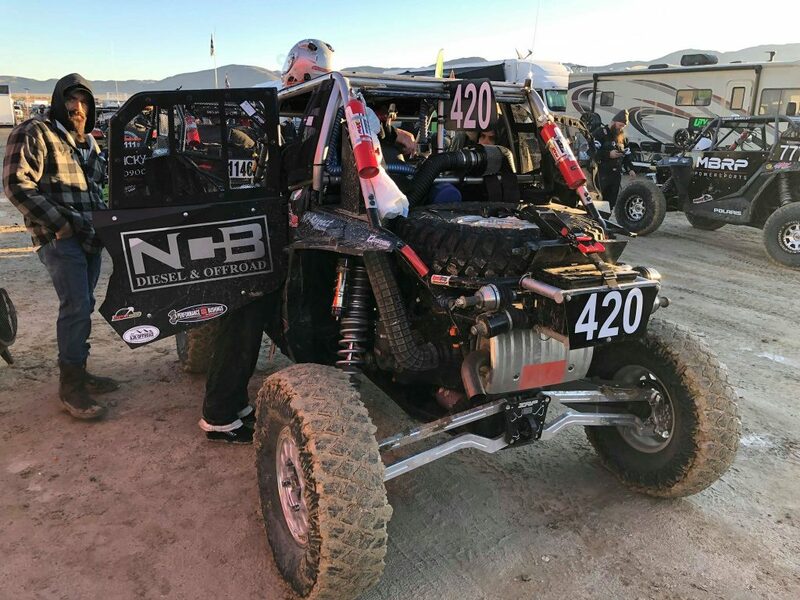 Next stop is 1b mile 73 for fuel and a quick check over water the shocks down as they are boiling hot we cross the finish line of lap one we had went from 57 all the way up to 20th physical on course. Lap 2 begins and as we go through the short course I see Phil Cagliero coming up on us at mile 93. Knowing he’s a true contender and we hadn’t even set foot on lap 2. I slow down to let him catch up and pass us so we can follow him. Our biggest mistake of the race was next we had another option to go left on Clawhammer or right up Full of Hate. We went left not knowing there was a traffic jam ahead. Cars are pulling up behind us and with nowhere to go we waited what seemed like an hour. As traffic is clearing with Sara Price in front of us she turns over and is blocking the entire path. I get out and call for help from many racers behind us we help assist her back over and we’re off again. Coming down jack we catch a valve stem with a rock and now have a flat on the right rear corner we stop for a field change at mile 113. Next stop is pit 2b for fuel and throw a fresh spare tire on the car. At this point clutches are making a noise that I compare to a ford power steering whine it’s only a matter of time now and at mile 134 boom there goes another belt. We’re in the back lakebed field we do a quick belt change and back in the car we go only to make it 300 feet something else is wrong. I pull back over get out and we had lost a axle boot somewhere and there was zero grease left in the rear passenger axle and it had got hot and pulled out of trans. With the tools we had we couldn’t get the axle nut to loosen up so we beat it back in with a crescent wrench. Now at the base of Outer Limits is where everything went bad! Mile 139 we make our way up to the first pinch point and every time I go over 1/4 throttle the cab fills with belt smoke. Now it’s time to winch. Well we had hit so many rocks with the front that the bumper had the winch power cable smashed and grounded out. Every time we hit the winch button it tries to kill the car. At this point we are the traffic jam as others are catching up. So we back out and pull off to the side to get our winch issue figured out. Others are having a hard time where we were at so we winch up and over the hero line on the right. And swap another belt onto the car as we wait for them to clear the easier line. 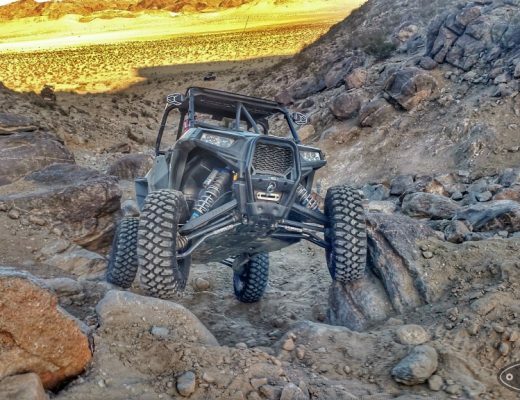 The decision was made to leave the belt cover off this time and at the very top of Outer Limits yet another rock takes out the passenger rear valve stem. Quick tire swap and we moving again. Our last stop is pit 2a mile 140 at this point the factory steering rack is about to fall out of the car. Our pit crew put another spare tire on the car and all the belts they could find. Finally smooth sailing to the finish line making a few more passes. We had done it against all odds completed 166 miles in 7 hr and 5 mins started 57th and finished with 1hr and 55mins to spare for a 17th overall !!! All though a finish isn’t what we were after considering all the issues we had it’s truly amazing we even made it and to pull off a 17th we were pleased with. Our pit crew was amazing this year can’t thank them enough. 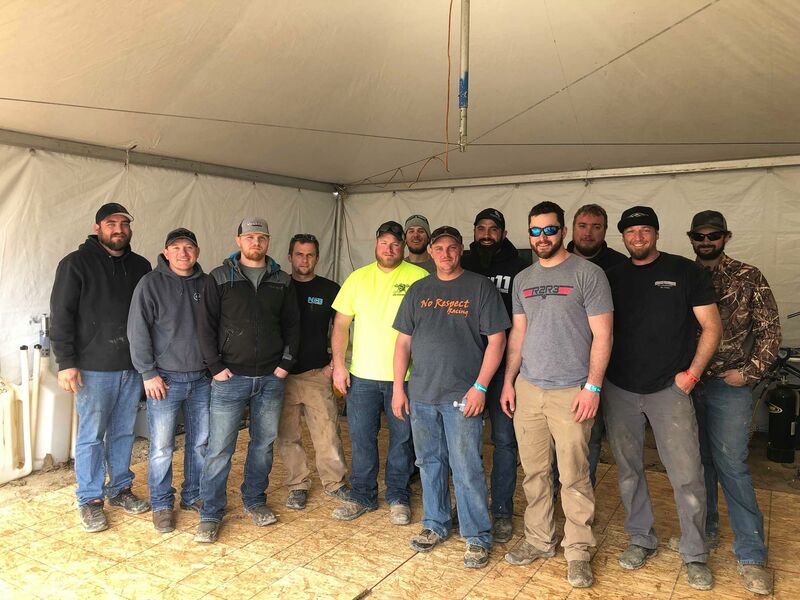 Also huge congrats to our Midwest pit partner Evan Engelhardt on his 6th place finish.